I first saw this strange device back in March 2010 when I got my Brompton S3L-X. I was searching for accessories and on a Spanish website I spotted this strange looking add-on cross-bar. The strangely named ‘IT Chair’ is steel in construction with one clamp and two folding rubberised footrests. 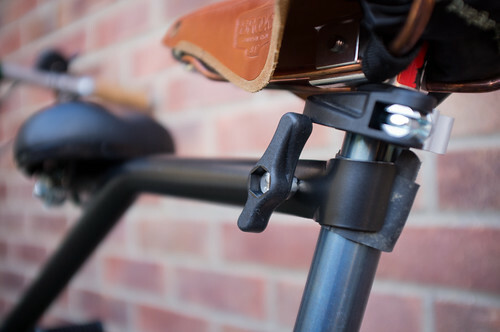 The clamp fastens to the seat post and the other end slots in just behind the crossbar hinge. Once fastened it feels pretty solid and the addition of a small passenger makes it even more so. The seat clamp wasn’t rubberized so as a temporary fix I added a strip of rubber cut from an inner tube. With the ‘IT Chair’ attached and no passenger I have to ride with knees slightly apart as I have a large comfy seat attached to it. It’s not uncomfortable to do so and I feel a larger seat is safer. With a little passenger your knees are a little wider but I got used to it quickly and as my lad is probably a little young to be doing any major miles on this, it felt safer having him cradled between my legs and arms. Folding the bike up with the ‘IT Chair’ attached takes a few more seconds than normal but it’s easy enough and works well. Folded size is a little larger but only a tiny amount and not enough to affect practicality. Costing £210, (without the seat) the ‘IT Chair is not cheap but at the moment it’s unique. I really enjoy using it and the lad totally loves it. 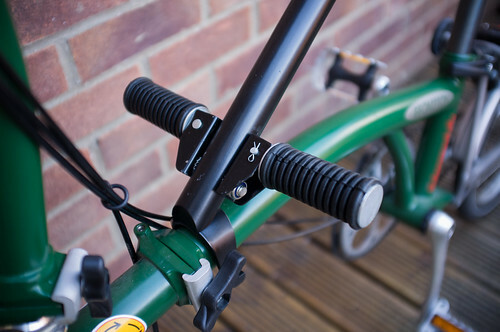 Even though it’s certainly more precarious than the larger bolt -on bike seats that cocoon a child and strap them in. Bear this in mind should you want to buy one. It goes without saying that any child riding on one of these needs to wear a helmet, be capable at holding on to the handlebars and have a good sense of balance. That said, I wouldn’t hesitate to use it for short trips with the lad, especially as it means we have the freedom of stashing the Brompton in the car to get to new and interesting places to explore. UPDATE: The IT Chair is now called the Pere and still available in Spain: http://www.milianparts.com/en/products/pere/ but I hear there are possible some UK possibilities coming soon. Talking, teaching and documenting using mobile tools. Running workshops and consulting worldwide with a focus on social technology. As a Brompton fan I must say this looks very nifty, especially as it doesn’t compromise the essential features of the bike itself. Hi Christine, Yes, we weren’t going particularly fast but i was surprised how well he prepared for the stops. Initially I thought about clipping the lads belt to mine with a tiny bungey but i think i would forget and drag him off when I got off. So instead i’d be tempted to fasten a strap to the back of the child seat to his belt or round his waist. The other thing to keep in mind is the reverse possibility of the adult rider crashing into the child’s back. Last autumn the driver of a parked car opened their door at point blank range just as I was cycling past. The bike’s brakes worked fine but I kept going and thumped into the inside of the door. Had a child been sitting in front of me then they would have been squashed between the two. I don’t want to pour cold water on the idea of this seat because I think it’s a really cute idea. However, I think it would be wise for the designers to take these thoughts on board and have some answers. It’s easy to forget that even at the relatively sedate speed of 10 mph (I can’t peddle much faster) these things can happen. The force of my own collision left me with extensive bruising across my chest for about six weeks afterwards. If you are really that concerned, this kind of device could be reserved for the cycle paths, parks and other such areas. This is great I’ve been looking for an ITChair for a year! I knew they had stopped producing them and that Steve Parry had started doing a similar model made to order, but I really fancied an ITChair, if you still in doubt after this article, check out all the older comments available on web when the ITChair was in production, the orginal Spanish web page shows the fold,cartoon style. love this blog, and many thanks for finding the new ITChair……. Do you know what the maximum weight (for the child!) would be? As the bar rests on the frame I am pretty sure it will take all the way up to ‘Porker’. I don’t remember seeing anything in the paperwork. 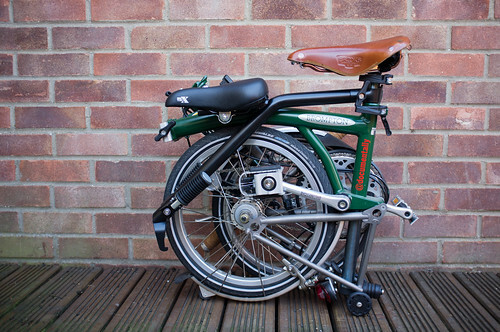 I saw one of these in a British recumbent mag years ago and thinking it would be perfect for my boys, promptly went out and bought the Brompton, but never managed to purchase the accessory. Instead, I discovered that my boys were perfectly proficient at standing on the crossbar. In fact, I would pick them up from karate regularly and have one standing on the crossbar and one standing on the rack on the back and we would pootle back home quietly through the university together like a big cuddly circus act. It was a blast. Ahhh. Life was simple then. A few advantages of having them stand on the cross bar instead were: less kit, child would not get sleepy (alert=safe), child could easily jump off when they wished (but always between my arms so I could grab them if necessary). We never found it dangerous in any way. Just like anything that has wheels, there is ample opportunity to be stupid if you want to, but why would you? The furthest we ever rode like that would be the few km to kindergarten, and we would always look forward to it. It was a real treat. Also had (still have) a child trailer, which was also great and probably safer and probably even easier, also convenient with a rain cover, but this was much more pleasant-a real bonding experience every time. It brings a smile to think of all the secrets and inner thoughts that would flow from my children whenever we did it. I am sure the it-chair would have exactly the same effect. I just found that we didn’t need it. Will this chair fit all Brompton bikes? 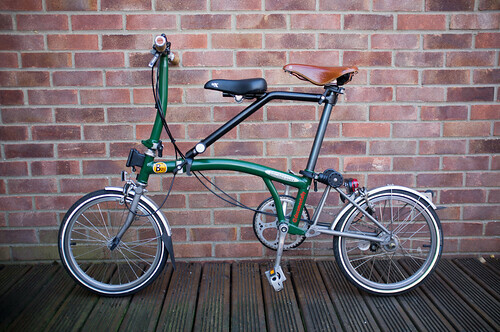 I am planning to buy Brompton M3L 2012 or S2L 2012. Will I be able to fit the chair on these bikes? It may be worth contacting bike fix. I dont see any reason why it wouldn’t fit all Brompton’s. Would this work on a bike that’s NOT a Brompton? 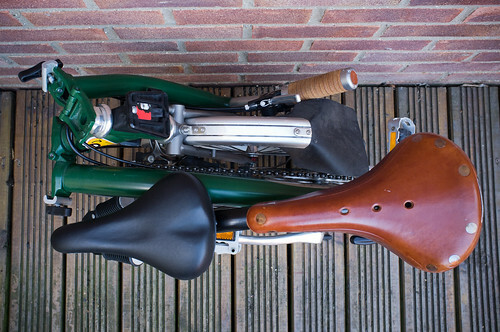 I have a vintage Raleigh and would love this kind of seat on it! Good question. Not having a vintage Raleigh myself it would be hard to judge. I would say though that although made for the Brompton frame there is a little tolerance it seems and if you could find the frame measurements of both bikes and compare, you may be in luck. Bike Fix are easy to contact should you want to ask them directly. They may have the answer to this already. Please let me know your findings. i just see the catalogue to know the price of this baby seat but i cannot find it, why? Can you help me?